Hello everybody! Today, I’m taking part in Top Ten Tuesday, for which today’s theme is books you’d like a sequel for. I only have 6 on my list because I couldn’t come up with a full 10, but I’d really love sequels for all the ones I’ve listed. Onto the post! The Eye of the North– this was Sinéad O Hart’s debut, and I really enjoyed it. It was such a wonderful adventure with lovable characters, and I definitely think the possibility of a sequel was there from the ending. The Star Spun Web– I’d also love a sequel to Sinéad’s second book, because again it was such a phenomenal adventure and I love the characters so much. In this case there’s also the fact that a few loose ends were very definitely left that hinted at what a second book in this world could be. I still have a lot of questions even though it was super satisfactory as a standalone, and I’d be delighted if a sequel got announced. Brightstorm– this is a little bit of a cheat because I know a sequel is on the way, but I have to wait till 2020 so I’m still counting it. Though Brightstorm wrapped up really well, there are still so many loose threads that could be explored, the world was amazing and I want to see more and I love these characters a lot. Reel Friends 3- I really liked the first two books in this series, and I’m so sad that Catnip never published the 3rd in the trilogy, which was planned then cancelled. It was due to be Hannah’s story, and I’d really like to read it still. These books were about friendship and film making and finding yourself, and they were so enjoyable. The Girl Who Walked on Air- this is my favourite of Emma Carroll’s books, and I’d love to see Gabriel and Louie face a new enemy or challenge in their circus lives. I also just want more of those characters in my life, as well as the super fun setting of the circus they live in/work for, and the found family vibes. Also, Pip is one of the best animal characters ever and I need more of him being precious in my life. Boy in the Tower- this one is entirely selfish, tbh. I just want to see how things are going for Ade and his friends/family after the events of BITT, because they are all wonderful and I hope they’re living very happy lives despite all the really awful stuff they went through. What book would you most love to read a sequel for that doesn’t have one at the moment? I’d love to hear in the comments! Hello everybody! Today, I’m going to be sharing my favourite book couples from titles I read in 2018, alongside a short reason for why, as part of Top Ten Tuesday. There are a few quite strange patterns, which it was interesting to notice for me writing this. Onto the post! Norah and Luke from Under Rose Tainted Skies– this was the first one of these I read, and as such this was the first time I was rooting for a couple in 2018. I’m glad it was these two, because their relationship is so special. Norah has agoraphobia, and I loved how this was dealt with in every way- it develops very organically and in such a lovely way, and Luke doesn’t magically cure her, as happens in some books. Sophie and Luca from the Blood for Blood trilogy– I think I was team Nico in book one (which I read in early 2017), but only because Luca wasn’t that prominent. From book 2 onwards I couldn’t have shipped him and Sophie together more, because they had way better chemistry and much more memorable moments. Finch and Hector from Flying Tips for Flightless Birds– these characters are both utterly precious and wonderful, and their romance is so, so lovely. Watching them open up to each other and bond after a rocky start was such a joyful read (though admittedly sineltaenously stressful because I was hissing “GET TOGETHER, YOU PAIR OF ABSOLUTE MUPPETS, YOU ARE MADE FOR EACH OTHER”) Flying Tips is super underrated and I’d highly recommend reading it. 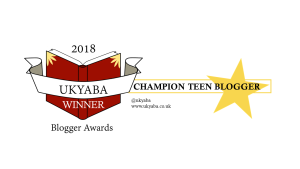 Lou and Robert from a Sky Painted Gold– I read this when I was feeling really ill one day and was struggling to move from the couch and it transported me to the 1920s setting in which these two characters fall in love. Their relationship is phenomenal both in the build up to them being a couple and after, and I was so invested in them. Reagan and Matt from Open Road Summer– this romance was EVERYTHING. I loved both of these characters so much as individuals and they were perfect for each other. Their flirty pre getting together banter was on point and they’re even better as a couple and just so much yes to these two. Hope and Luke from Theatrical– Theatrical was SUCH a great romance book- it’s Set in a theatre and the main couple are lovely. There were some absolutely GORGEOUS moments in this, and I was rooting for these guys the whole way. Dylan and… someone from Boy Meets Hamster- I can’t tell you who the 2nd person in this couple is because it’s a bit of a spoiler but oh my GOD is this relationship adorable. My heart was literally melting every single time they interact. They really reminded me of Simon and Blue, and I can’t give much more of a compliment than that. The whole book actually feels a bit like a British Simon Vs actually! Lara Jean and Peter Kavinsky from To All the Boys I’ve Loved Before– what can I say, I’m a sucker for a fake relationship! This is one of the best, in my opinion. Their fake relationship is so fun and I love their real one too, and their relationship is such a wonderful part of this trilogy. It’s amazing in the film too, even though they do things quite differently! I did like John Ambrose McLaren too though, to be fair. Suzanne and Matt from Fierce Fragile Hearts– if this list proves anything, it’s that a bunch of my fave couple feature musicians. This romance is a brilliant part of an exceptional book, and I loved the way this developed a great deal, even if I wanted a different end for them a bit. Cara and Hector from the Year After You– so, I’ve went on about this book a lot since I’ve read it, and basically don’t expect that to ever stop because it’s AMAZING and I loved it so much. Cara and Hector were a big part of that. I loved the ways in which they help each other heal. I loved their interactions, whether they were hilarious or heartbreaking or somewhere in between. I loved the fact that they aren’t perfect and make mistakes, but want to make it work. I just love them. I definitely saved the best for last. Who were your favourite couples in books you read last year? Do we have any in common? I’d love to hear in the comments! Hello everybody! Today I’m taking in part in Top Ten Tuesday, and for today’s freebie theme I’m using an older topic about books I have really specific memories of. Some of these are pretty random, but I’ve tried to include a few I’ve not spoken about before as well as some I have! Onto the post! Today, I’m taking part in Top Ten Tuesday, and as the theme today is about platonic relationships I thought I’d list some of my favourite families/found families (with a slightly smaller list because I could have went on forever and I didn’t want to get carried away!). Onto the post! The Manners from Geek Girl– I’m sure no one who knows my feelings on the Manners is shocked they’re on here- they’re the best. Their interactions are almost always hilarious, and heartwarming/touching when they’re not. I just love them. I’m so thrilled that Holly Smale’s next series centres on a family, because she’s amazing at writing them if this one is anything to go by! The Weasleys from Harry Potter– who doesn’t love the Weasleys? Each and every member is wonderful (maybe excluding Percy…), and they made me laugh and cry throughout the series. Zorie and Joy from Starry Eyes– I read this just a few weeks ago (my review will be in my reviws post next month! ), but Zorie’s relationship with her stepmum became a fast fave for me. Their dialogue together is so great, and the way they support each other when there are some revelations that rock the family is super, super lovely. Morrigan and the staff of the Hotel Deucalion– this is the found family I was referring to. I love how kind the staff of the hotel all are to Morrigan, and how much they care for and protect her in both the books so far. They all go out of their way to make her happy, and it gives me such a warm glow. The Daniels family from When We Collided– this family are going through a really difficult time when we meet them, and the way the older siblings are looking after the younger ones is incredible. I loved how much they all clearly loved each other. Stella and Felix from Polar Bear Explorers Club- Felix adopted Stella when she was young, and I love how encouraging and kind and supportive he is. Their house is amazing too, and I love that he lets Stella have some very unusual but fantastic pets! The Coveys from the Lara Jean trilogy– this family is one of the loveliest ever, and the close relationship between Lara Jean, Kitty and Margot is fabulous. The way they are with their dad is great too; their mum passed away before the book began and so he raises them single-handedly. Who are your favourite families in fiction? I’d love to hear in the comments! Today, I’m taking part in Top Ten Tuesday (hosted by Jana), and today’s theme is bookish items we’d like to own, and like with my past few TTTs I’ve done a shorter list as I was struggling to come up with the full amount, mainly because most books I love don’t have items for them that I know of. Onto the post!